10/8/2004 8:55:52 AM Mountain mjs:: I am looking for sideways or a possible turn up. How strong is P? Looks like on the WOF prices like it and are moving along it to to it. 10/8/2004 8:22:12 AM Mountain mjs:: So there are the tools on the chart and the tools in your head to use. 10/8/2004 8:19:50 AM Mountain mjs:: there is a comment about the Node 1141 but the date is Oct 13 it is identified as an "attractor" so does that mean the expectation is up to there. That seems a long way off in time to action today. 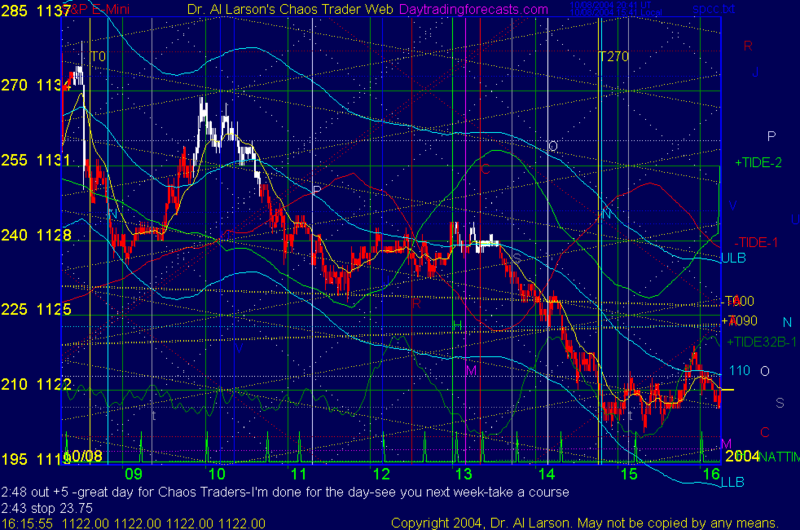 10/8/2004 8:16:01 AM Mountain mjs:: The last 3 clinics the trades were being taken off the crossover of the 20/110EXMA. I kept thinking there must be a way to trade the retrace and glad I got to see it here. 10/8/2004 8:14:05 AM Mountain mjs:: it was a very nice trade. seeing some clues as to how it was identified and traded. Looks like the 20EXMA was the biggest key outside experience and knowing the chances for a retrace to the mean 110EXMA. Still nice trade. 10/8/2004 8:06:21 AM Mountain mjs:: I will have to look in the courses for more on this OOB. Unless it is in the FOG I haven't purchased yet. 10/8/2004 7:52:59 AM Mountain mjs:: so the fast turn in the 20EXMA and the hi slope was the tip off at 9:33. But still seems like there was an expectation of this reversal. 10/8/2004 7:47:26 AM Mountain mjs:: once out of band is the assummption prices will return? or it this more experience of trading this type news?